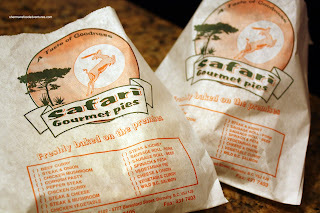 For the longest time, I have heard about Safari Gourmet Pies. I discovered it while surfing the internet for possible restaurants to try. It was intriguing for a couple of reasons. First, it's in the oddest of locations. Surrounded by autobody shops and warehouses, you would not expect a meat pie here. Second, it's not your Swanson's meat pie (bleck! ); rather, it's supposed to be "gourmet". I was extremely interested in trying it out. Finally, Foodosophy visited the place and blogged about it. Awesome! I can now put description to picture. It looked meaty and yummy to me! So, without further adieu, I made it a priority the next time I'd be in the area. Almost by fluke, I needed to go to NCIX on Kingsway to pick up a few items. Thus, I'd be passing right by Beresford! I made a slight alteration to my route and stopped by to pick up a couple of pies. Occupying the same building as Out of Africa Trading Company, the actual store is quite non-descript on the outside and very minimalistic on the inside. To the left of the front counter, there are a few products for sale. Various pies sit in a small warming oven right on top of the counter. Again, with my limited knowledge of African food, I believe meat pies are Western and/or Southern African cuisine. I had to ring a bell to get service. A small friendly Asian woman came out. I inquired what would be the best pie to try if I only got one. She confidently replied, "the Pepper Steak". Sold. I got one of those. Of course, you know I couldn't only get one... So for good measure, I picked up a Chicken and Mushroom as well. When I got back home, I tossed the items from NCIX on the floor and rushed to the kitchen. Yah, I know what is more important! Cutting the pies open, revealed big pieces of meat occupying most of the interior. The pepper steak lived up to its name and it is indeed good eats. The pie crust was not too thick and flaky on the top. I liked how the crust was not soggy at all on bottom. This is probably thanks to the thick, meaty filling. 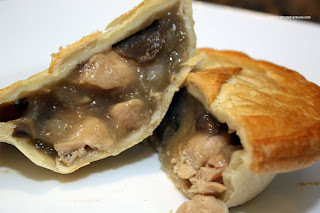 Despite being packed with big chunks of chicken and mushroom in a thick roux, the other pie was not as flavourful. I mean, I could taste chicken and a bit of the mushroom; yet it could've used some salt. For those who have milder tastes, this one would fit the bill. 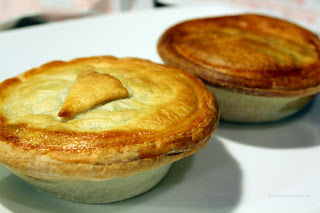 Whatever the case, the one thing that sets these meat pies a part from the usual fare is the abundance of meat. Usually, with frozen generic pies or even the ones found in supermarket delis, they lack any substance. Furthermore, there are many different pies to choose here, from the exotic to the usual. Combine that with a thin, non-soggy crust, you have some good eats from an unusual location. 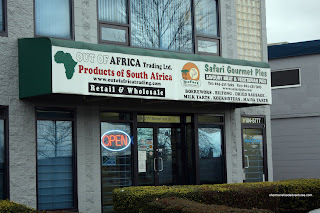 I used to pick up their meat pies when they had an outlet at Cambie Shopping Centre which is now closed. For some odd reason, I thought they were australian based. Oh well, nice to know I can now pick some up in my neighborhood. Yah, I really shouldn't chuck sensitive computer stuff on the floor... But food is more important! Hmm... Salmon pies eh? Good idea. Holly, you might want to thank Foodosophy, they seem to find unique places too! Including this one! 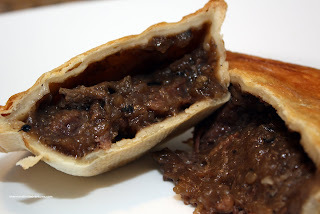 I missed the roast lamb w/mint sauce pies sold by a vendor at London's Euston station. I came across it by chance on the last night before I left 3 years ago... the flavor and smell still lingering on my senses. Yum. Safari Pies. I think you can still purchase them frozen from Sweet Williams at City Square. I want one right now. It shows that food is very much a personal thing. Yes, I need to try the biltong next time! Trisha, you're in luck! I would like to inform you that they do, in fact, sell Salmon Pies! I finally visited the place. As soon as I stepped in and bought 12 pies, the owner asked me if I came because of the "blog". Then after me, there was another Asian person and the wife owner said, "I think that's Sherman." Hmm...was that you? Would you re-visit a place and not blog about it? Anyways, good stuff. Thanks for the heads up. I think I tried the steak and kidneys...and YES, they taste like real kidneys...er..duck kidneys I guess. LOL Anson. It probably wasn't me. Funny. But I will go back, the pies are pretty darn good! We found this place only about a month ago because we were looking for meat pies for an Australia Day party and have been going back once a week minimum. Not only are the pies great, but the price point is ideal and it doesn’t break the bank. The owners are great too, and I find that in addition to going in for pies, we stand and chat for a bit before leaving. There’s one little subtlety which I haven’t seen mentioned in any of the blogs yet, and that’s the labelling system via the little pieces of pastry dough at the top of each pie, so you’re not left to guess what you bought. It’s a really small thing I know, but it proves huge when you don’t want to bite into something you didn’t want (like in cases like ours where we bought 20-ish pies for the party. Anyway..the great tasting food combined with the friendly owners and the frequent buyers card (buy 12, get the 13th free) will keep bringing me, along with my friends back. I should probably add the weird location rationale which you already know about but some of the readers might not...they're mostly an import business first and in the business of pies second. Burnaby Bylaws require the business to be located in an industrial location because of its primary nature, which is why it ends up being a little out of the way. Trisha > I think they make salmon pies. It's on the sticker legend they give you on the way out. Thanks for the detailed comment Matt! You can mention the other site! We all know about it anyways. ;) Such a hidden gem. I hope other people give it a try! Safari's closing at the end of the month. Probably your last chance to get the goods. They'll be missed.